The injury-prone striker is continually linked with a move away from Liverpool. LIVERPOOL MANAGER JURGEN Klopp offered no assurances over forward Daniel Sturridge’s future at the club. The England international has battled numerous injuries this season, making just five Premier League starts and scoring twice. 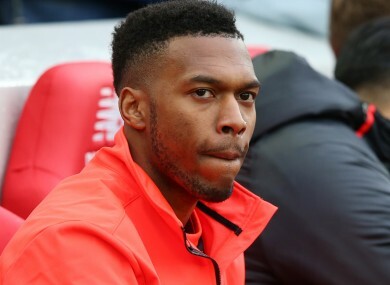 Sturridge, 27, was linked with a move away in January but ended up staying at Anfield, although speculation over his future continues to persist. Klopp said Thursday he gave no consideration as to who would exit his squad in the off-season, as he looked to Sturridge to possibly give Liverpool a boost late in the campaign. The thing is that it was not an easy season so far but there are still six games to go and he is back. I’m happy about this,” he told a news conference. “He had an impact when he came on against Stoke. We have to decide always after the few sessions he made, like I said after the game, ‘how long should we force it or try to use his freshness when he is coming on?’ That is my decision at the end. Another player whose Liverpool future is uncertain is Mamadou Sakho, who has impressed since his loan move to Crystal Palace in January. Klopp has kept an eye on the France defender, saying: “You can imagine like all the plans we have for next season, we speak about behind closed doors. Email “Klopp gives no guarantees over Sturridge's future”. Feedback on “Klopp gives no guarantees over Sturridge's future”.